Path of the total solar eclipse of Aug. 21, 2017. Get Ready for the Total Solar Eclipse of 2017! 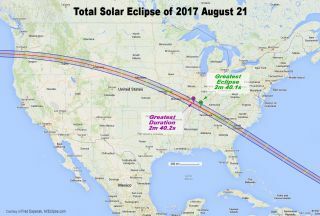 On Aug. 21, 2017, the "Great American total solar eclipse" will treat skywatchers across the continental United States as the moon passes before the Sun. This photo guide is packed with information about the historic event, including maps, charts and infographics to help you safely and successfully observe the solar eclipse. See our full viewing guide for the 2017 total solar eclipse here. During the total solar eclipse, skywatchers will see the sun's atmosphere, which is typically hidden from view. The atmosphere features jets and streamers of hot gas that are difficult to resolve in photographs. This composite image makes them visible. This map shows the path of the moon's shadow during the Aug. 21, 2017, total solar eclipse. Viewers in the shaded region will see the eclipse reach totality, when the moon completely covers the disk of the sun. The time and duration of totality depend on where you are located inside the path. Outside the shaded region, viewers will see a partial solar eclipse. Anyone planning to drive to see the total solar eclipse should plan to encounter lots of traffic. Aug. 21, 2017 could be one of the worst traffic days in U.S. history, as millions of people are expected to commute into the path of totality. This graphic, by eclipse cartographer Michael Zeiler created this graphic showing major roadways leading into the eclipse path from highly populated areas. This image of a total solar eclipse was taken eclipse photographers Imelda Joson and Edwin Aguirre on July 11, 1991, in Baja California Sur, Mexico. While it is possible to photograph the eclipse, most experts recommend that you simply enjoy it, especially if it's your first time seeing a total solar eclipse. This map shows the different times at which the solar eclipse will begin across the United States. This map shows the different times at which the solar eclipse will be at its peak across the United States. This map shows the different times at which the solar eclipse will end across the United States. This table shows where, when and for how long the Great American total solar eclipse of 2017 will happen in major cities across the path of totality.